We have a fleet of more than 80 vehicles and 90 trailers to facilitate the wide range of services we offer. To build a fleet on this scale it’s essential to have a fleet investment strategy as capital investment required is significant. You can read more about this below under the heading Fleet Investment Strategy. We have some 60 tractor-units currently operating with an average vehicle age of under five years. These have been sourced from a range of manufacturers over time who include: DAF, Iveco, Mercedes, Renault, Scania and Volvo. Over the years we have enjoyed relationships with every major manufacturer. You can find photographs of some of our current fleet and former fleet units under our Gallery. We are proud to boast a fleet of 4 self-load hi-ab vehicles with the largest crane offering a 14 ton lift. 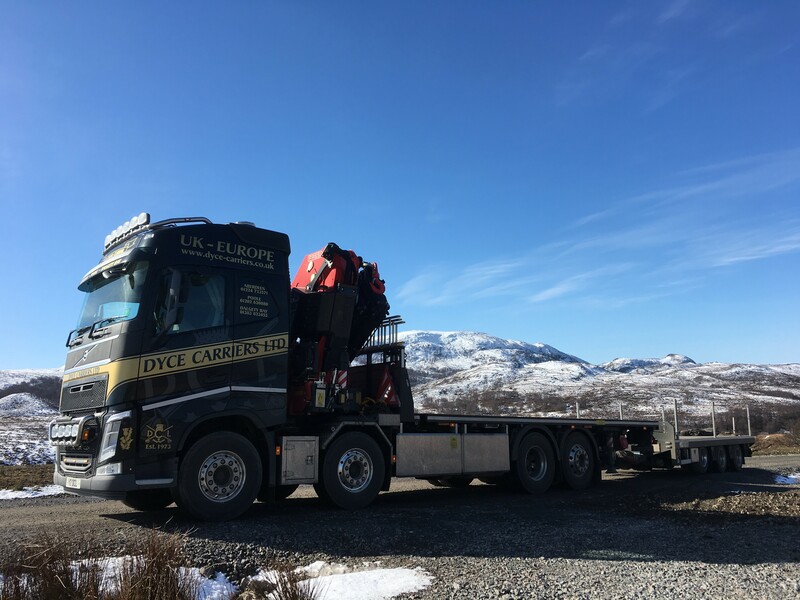 This one stop shop of a crane as well as a vehicle for transporting your goods will reduce your overall haulage costs substantially. In our fleet we operate category 2 special types vehicles to handle a multitude of abnormal loads including but not limited to loads of up to a GVW (gross vehicle weight) of 80 ton. We have approximately 90 trailers within the fleet in different specifications and sizes. The majority of our trailers are flats and these are supplemented by curtain-siders, step-frames and low-loaders. Typically a well-maintained trailer will last for a little over ten years. It pays to have an effective maintenance programme to optimise trailer life cycle. We have an in house team responsible for maintenance of our fleet. We rely on the respective manufacturers for specialist and detailed maintenance requirements. In Aberdeen and Poole, we operate our own garage and mechanics to provide front-line maintenance support. One key maintenance support contract is provided by Bridgetone. A good tyre management programme is essential in terms of operational support. Bridgetone provide an excellent service to enable efficiency within our fleet maintenance. We understand that many different people with different interests will visit our website. 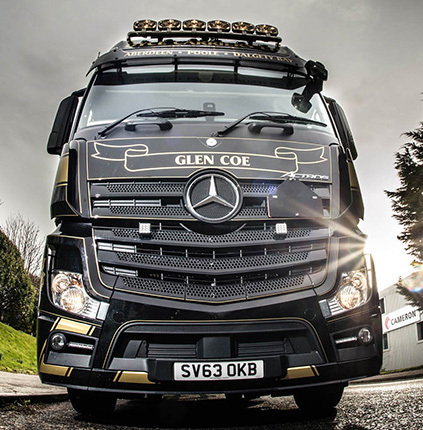 This will vary from customers, suppliers, our own team and their families and friends to people with a passion for the haulage industry and more. With this in mind we decided to give our visitors the opportunity to look behind the scenes to gain some appreciation of what goes into operating a road haulage business. Our fleet investment strategy is part of this insight. Cost planning in an industry where costs such as fuel and wages can attribute to in excess of half the running costs, is essential. Our fleet investment strategy reflects the need to plan capital expenditure wisely. As the cost of fuel continues to play a key role in financial performance the advent of diesel electric and naturally powered gas units may represent a key change in future haulage economics. We look forward to trialling such units. Although investment costs at the outset may be greater the lower operating costs over time are worthy of consideration. In addition to the mix of operational and financial factors that need to be considered such as reliability, serviceability, manufacturer support and operating costs, we take the views of our various stake-holders seriously. From drivers, to safety advisers, customers, environmental bodies and accreditation agencies, each has to be given due consideration. Years ago leasing was something of a rarity. However, in recent years the support of the Manufacturer in maintaining modern sophisticated technology in the vehicles has become absolutely crucial and this combined with a greater availability of lease options has meant that more and more Hauliers use leasing within their fleet strategies. Trends can fluctuate and given that we replace between 10 and 15 units a year the relative value of leasing versus outright purchase is a variable that requires regular consideration. Like any investment there is no certainty that one strategy will out perform the other, and therefore at Dyce Carriers we mix both. With the best will in the world it is almost impossible for any Haulier to provide a level of maintenance support that comes close to the Manufacturers’ capability. The training and diagnostics necessary to maintain modern equipment is significant. The risk and cost of equipment failure is a fundamental consideration. Where tractor units can cost between £90,000 and £120,000 pounds it makes sense to apply a balanced risk approach to hedge against various equipment failure, maintenance quality, maintenance costs, and future value fluctuations for example. But the quality of the maintenance package and manufacturer support on offer plays a huge role in selecting a set of vehicles. Since we typically change out the fleet in sets of five vehicles at a time, the life cycle support costs are factored into the equation which amounts to a significant level of investment.